See, I told you it was easier to write about the churches and buildings I saw over the life changing experiences. Updates about Ukraine are coming…I really do promise! To finish off my previous post though, I had another day and a half in Krakow. 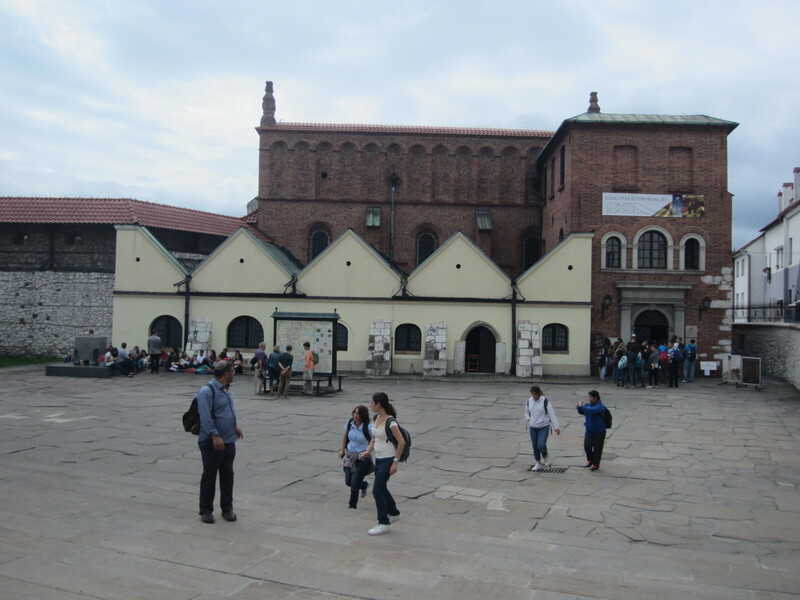 Monday morning offers free admission to various parts of the Wawel Castle. While I had already wandered the grounds, I decided to go and see what tickets I could score. The thought of touring royal apartments and paying a fair load to do so only haunted me with thoughts of the crazy blizzard I sought shelter from in Vienna. It was very unclear if I missed out on anything else, but I did get a free ticket to the Lost Wawel and decided to pay a dollar to climb the tower. I also felt it was necessary to spend another dollar on anything with the title “Dragon’s Den” – especially considering I have been called the dragon or the girl under the stairs for the last 7 months. I got to enjoy the beautiful cathedral and grounds on another lovely morning then made my way to the Lost Wawel. It is basically an exhibition of an excavation of part of the grounds. It looked pretty neat at first glance but I can’t tell you much more than that because the room sent me into the biggest allergy fit yet (throat and eyes swelling, sneezing without a breathe in between, yuck). The fact that my throat was reacting really freaked me out though so I left immediately asking for the nearest pharmacy. For a collection of reasons, I have been allergic to everything for about 2 weeks even on medicine. I thought the pills weren’t really working so when I ran out of them, I figured I would be fine for one more day before flying home. Well apparently the pills were helping me subside symptoms from crazy allergies to normal allergies. I did find a pharmacy and spent the next hour finding solace in a cafe where I was protected from cigarette smoke and flying dust. I normally don’t react that badly, but my body is so over run right now that everything is irritating me. Happy to have my symptoms subside to less frequent sneezing, being able to breath, and a more tolerable runny nose – I decided to try what I could. Turns out I needed more time as the cotton wood and dust filled gusts attacked me. A mani/pedi it was at an actually air condition and clean spa. Seriously, it was worth it just for the clean air. Not to mention a few moments to adjust to the grogginess created by my medicine. Ok, but enough about that….the outcome is that I have new pretty coral nails, I can breathe, and was able to set out again after that. Not totally knowing how long this would all last, I decided to make good on my ticket up the tower and headed back to the castle. Ever since my first trip with Sarah, I can’t help but laugh at the phenomenon that traveling equals stuff you should climb up. Seriously though, anywhere you go you will be offered a list of things to climb, richly advertised as a panoramic view – To say you did it and how many stairs you climbed. I used to have the mentality of conquer all, but I am glad I have chilled out a bit. Of course I want to see and do, but do I need to climb every bell tower, every fort, every town hall, etc? No, not really…I’ll save it for Kilimanjaro. Anyways, I did climb this tower and it was nice. I was happy I only paid a dollar and even more grateful that it was not crowded. It gave me a chance to enjoy the panorama and the area once used to shoot gunfire at enemies approaching the castle. I was most excited to see that I could still breathe and could finally make it to the Dragon’s Den. I mean, I guess it’s just a lot of stairs into a cave, but being the nerd that I am I was most delighted by the experience ending my tour of the castle on a high note. 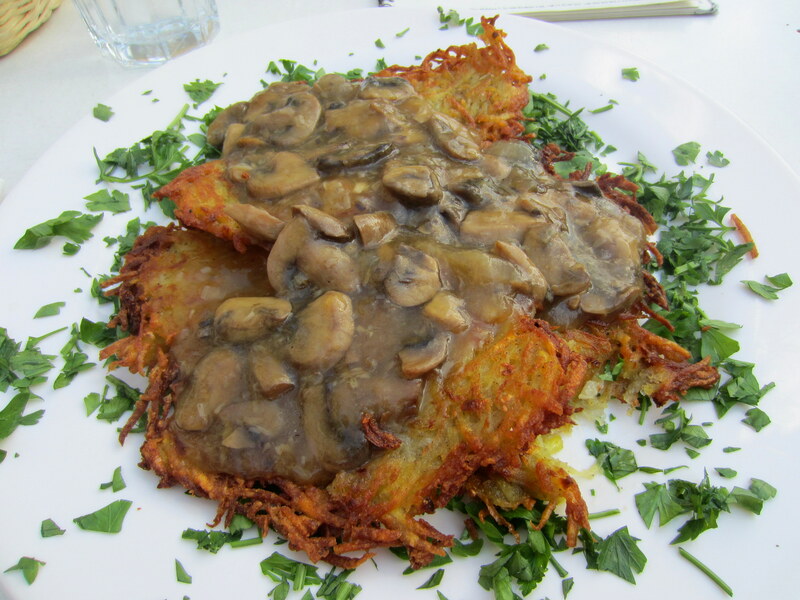 I took the long way back to my new favorite restaurant and decided to try the vegan/gluten free latkes. I still can’t get over the portion sizes! 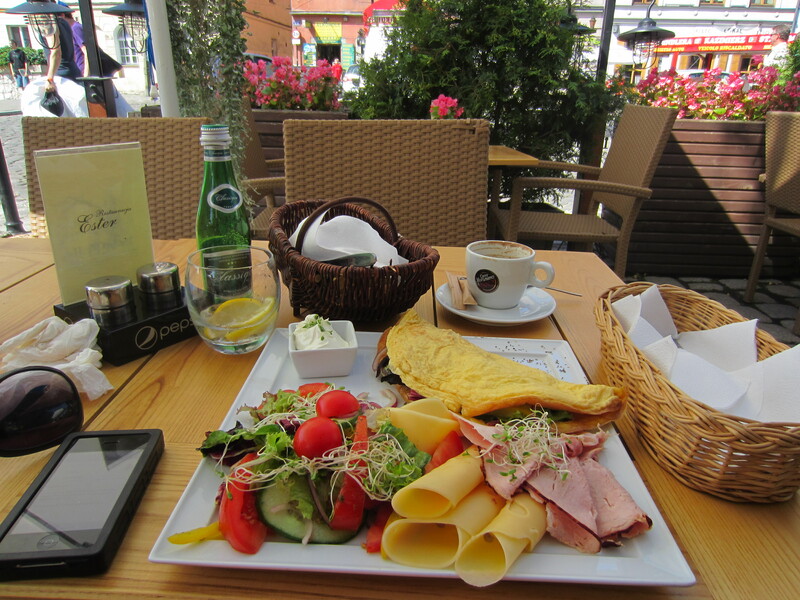 With coffee and a snack to supplement I only ate one big meal each day because there was so much food! The food was delicious yet again and I decided to spend the rest of the night atop my boat hostel and enjoy the late sunset along the river. It was delightful and I took the leisurely time to get organized for my check out the next morning. Tuesday…the last day of all these grand adventures. I made my way back through the Jewish Quarters and was able to tour the Old Synagogue. A leisurely breakfast at a nearby cafe/restaurant and a HUGE omelet later it was finally time to go order my taxi and be on my way. Driving to the airport through the outskirts of Krakow, I truly thought to myself, I think I could actually live in this city. Obviously that makes me biased on my recommendations to visit Krakow, but I personally recommend it as a must-do. I only saw and conquered a fraction of what is available, so I would also say it is very easy to fill a longer trip here versus some cities where a 3 day weekend is more than enough. The only down side is that a lot of the touring is geared towards groups. As a single traveler that narrows your choices to spend a lot of extra money or join a very large group to partake in some of the excursions. That is why I narrowed down what I was interested in doing this time, but I would definitely like to return and see/do more next time around. ‘Til then, thanks Krakow for being an amazing stop on my return to Canadia. As to climbing towers, I agree with you that it’s a bit silly to count the steps. But I like towers, especially these which are some centuries old. Sometimes the staircase itself is a bigger attraction than the view. so true! and these were especially beautiful!